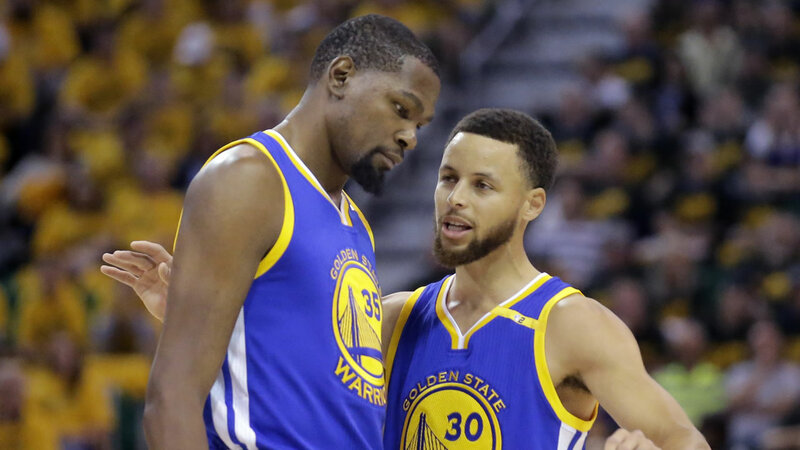 SALT LAKE CITY -- Kevin Durant had 38 points and 13 rebounds and the Golden State Warriors beat the Utah Jazz 102-91 on Saturday night to take a 3-0 lead in the Western Conference semifinal series. Stephen Curry and Klay Thompson were a combined 7 for 29 from the field and 3 for 15 from 3-point range, leaving Durant to lead the Warriors. The Jazz led 75-74 early in the fourth quarter, but the Warriors went on a 10-4 run and never trailed again. Curry and Durant hit back to back 3ss to give Golden State a 92-84 lead with 3:04 left. Curry finished with 23 points on 6-for-20 shooting. Gordon Hayward led Utah with 29 points. Rudy Gobert added 21 points and 15 rebounds. Game 4 is Monday night in Utah. The Warriors got out to a quick start, again, and led by 10 after the first quarter. Utah survived the first-half onslaught by Durant, who had 22 points and six rebounds at the break. There wasn't much the Jazz could do to contend a flurry of turnaround fadeaways, drives to the basket and a pair of 3s. Golden State, however, didn't get much help otherwise and Draymond Green dealt with foul trouble. The Jazz took a 50-49 lead into halftime after closing the second quarter on a 12-5 run highlighted by Rodney Hood's 3-pointer triple that gave the Jazz their first lead of the series at 48-47. Green picked up a technical arguing from the bench late in the second quarter after being whistled for his third foul of the half. As the crowd roared, he gave a 2-0 hand gesture to indicate the series record. The Jazz led by nine in the third quarter, but Curry began to warm up and hit his first 3-pointer of the game on a pull-up in transition. Golden State closed the quarter on a 19-8 stretch to take a 72-70 lead. Click here for more stories, photos, and video on the Golden State Warriors.